We’re thrilled to be heading into our third year of Speak Easy and to be announcing our 2019 schedule! 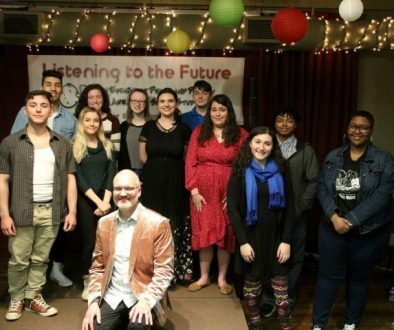 Besides our many very popular open-topic events, we’ll be bringing back our Halloween-themed Strange Tales reading in October, and we’ll again be part of the Rochester Cocktail Revival in May with our Stories with Cocktails event. We’ll also be closing out the Ladder Literary Conference Weekend in June, as we did this year. We have a couple of new shows to tell you about, that we’ve extremely excited about! 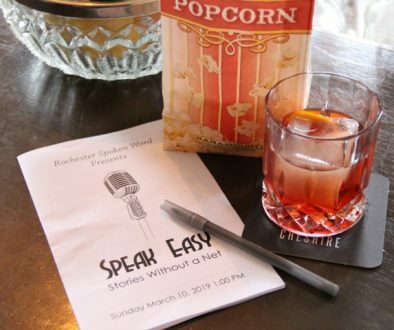 First off, in March, we’ll be hosting our first live-storytelling Speak Easy called Stories without a Net, where people tell stories without the aid of printed words. 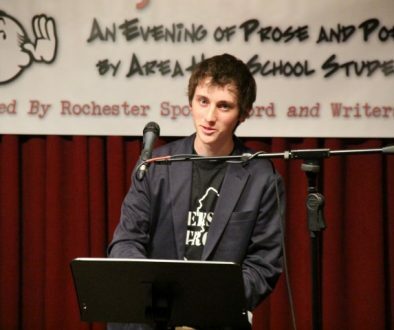 In November, we’ll host a Speak Easy made up of writers selected from our first-ever Rochester Spoken Word Short Story Contest. Keep on the lookout for more information about that. This year we’ll be taking the summer off so we can enjoy a little R&R and read the entries from the upcoming contest, so there are no planned Speak Easy events in July and August, but that will just make our return in September all the more special. The schedule is below. Please note that dates and times are subject to change, so you should always check our Events Calendar for the most up-to-date information. We hope we’ll see you at one or more of our shows, either in the audience or on stage – or both! To sign up to read at a show, click here. To buy tickets, visit our Events Calendar. (Note: Tickets typically go on sale 4-8 weeks prior to the show.) And don’t forget, you can save money by purchasing Speak Easy passes in our Shop. They make great gifts! 1/13, 1:00 pm — Speak Easy Birthday Party! Help us celebrate our 2nd birthday while enjoying some of the writers that made our 2nd year a success. Free party hats, cake, and prizes! 2/10, 1:00 pm — Speak Easy: Open Topic. Come enjoy short works of prose and poetry by area writers. 4/14, 1:00 pm — Speak Easy: Open Topic. Come enjoy short works of prose and poetry by area writers. 6/9, 1:00 pm — Speak Easy: Open Topic. Come enjoy short works prose and poetry by local writers. Our last show before Summer Break! 10/13, 1:00 pm — Speak Easy: Strange Tales. Get into the Halloween spirit with stories that are on the strange side. 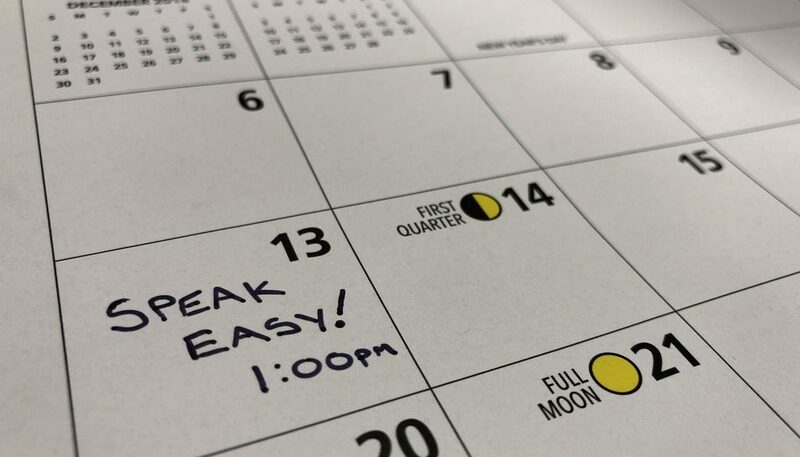 11/10, 1:00 pm — Speak Easy: Short Story Contest Winners. Come hear the winners and runners-up of our first-ever short story contest read their submissions. 12/8, 1:00 pm — Speak Easy: Open Topic. We finish up the year with one of the open-topic events that people love.